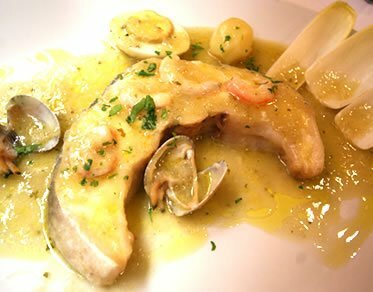 The food served at De la Riva is traditional Spanish market cuisine, and the menu is “sung” to the diner. 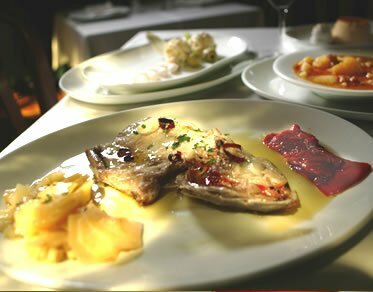 The menu changes almost every day, although some dishes are served year round, such as conger steaks in green sauce, leg of veal, fresh anchovies wrapped in salted ones, baby garden vegetables, squid in ink, hake delights, fried squid rings, Russian salad, oxtail, crème caramel, rice pudding and custard dessert, etc…. However, the seasons and traditions associated with food give rise to changes in the menu, making it more extensive and fun. With autumn comes our King oyster mushrooms, baked quince, game, the first stews and “spoon dishes”. 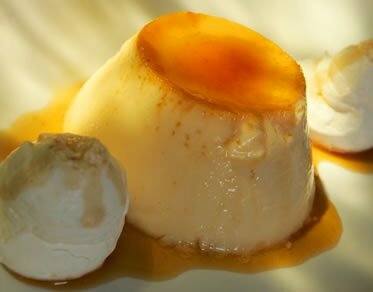 Winter, on the other hand, is the season of broad and Ibeas beans, roasts such as suckling pig, lamb and veal brisket, and dishes like cod with tomato, chicken in almond sauce and puff pastries with cream. Spring virtually coincides with the season for “fasting” (bean and bread) soup, the first beans and asparagus, French toast, and later on bonito, anchovies and cherries. 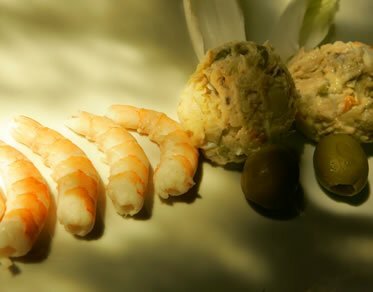 And in summer there is cream of leek soup and gazpacho, pickled horse mackerel salad, grilled coquinas, clams and cockles, boiled baby crayfish with mayonnaise, in addition to our homemade ice creams and sorbets. All of these products and many more are purchased fresh every day from small traditional markets in the city. We demand the highest quality because no one at De la Riva will settle for anything less. Work in our kitchen starts as early as 8.30am every day because we have to clean, prepare and cook the food to the highest standards. At this time of year, we stop making “cocido madrileño” (chickpea stew), except on request, and begin to make our potage de vigilia (chickpeas, spinach and cod “fasting” soup), which we serve every Friday. It is the season for artichokes, wild asparagus and peas, which we purchase from the De Fata family’s stall at the Mercado de Maravillas. The first Guernica peppers and mushrooms of the season arrive (March and St. George’s varieties). During the month of November, we will serve Cocido Madrileño every Thursday. This dish has a special significance for De la Riva. Before any customer gets to taste it, we eat it ourselves. As there are a lot of us, we were always bickering over the best bits, and so we decided to serve the “cocido” in two courses: the first was the soup with the noodles and chickpeas if so desired, and the second contained all the traditional ingredients, cut and presented in a much less exaggerated fashion than is customary. 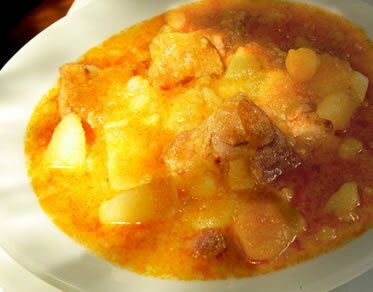 The result is a lighter and leaner “cocido” that is easy to digest, and if anyone would like a second helping, this is not a problem. 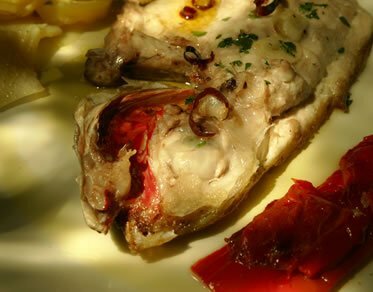 There will also be wild mushrooms, which we sauté in the pan with a drop of olive oil and a few pieces of Iberian ham. In addition to boletus and king oyster mushrooms, we have also ordered trumpet, chanterelle, sweet tooth, yellowfoot, fairy ring, charbonnier and parasol mushrooms, among others. Dishes will contain a selection of the mushrooms we receive that particular day. And we will also make red pine mushrooms with haricot beans, although these will not be available every day. Finally, in about ten days’ time we will begin to bake the first quinces of the year; these taste like baked apple but are incredibly flavoursome, and although they require a great deal more patience and time, the result is truly amazing. I would like to thank you for your comments on the new photo for the restaurant website; we had to touch up the colours, remove the drain, etc. What I couldn’t do, however, is reduce the number of people in it, because that’s how many we are. You can see the photo on the home page.